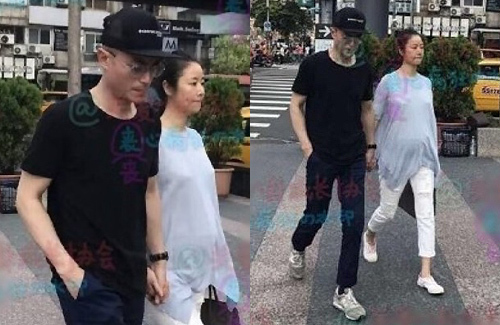 Although fans have longed for Ruby Lin (林心如) and Wallace Huo (霍建華) to bring their onscreen romance to real life, the couple surprised many when they suddenly acknowledged their relationship in May. Just as quickly as they took their relationship public, Ruby and Wallace got married in July. With the quick succession of events, pregnancy rumors ran rampant and were finally confirmed in September. In an earlier interview, Ruby had hinted that the couple was expecting a baby girl. Despite making multiple public appearances since confirming her pregnancy, Ruby proved to be a fashion guru and has been expertly hiding her baby bump. Earlier, Ruby went on vacation to Japan with good friends Shu Qi (舒淇) and Kelly Lin (林熙蕾). Although they shared many photos of their trip on social media, Ruby angled herself to hide her growing belly. Ruby and Wallace were recently spotted out shopping hand-in-hand. Donning loose, comfortable clothing and walking shoes, Ruby’s baby bump was finally spotted. The mother-to-be appeared to be nearly six months pregnant and in good spirits. Despite being bombarded by reporters, the couple remained courteous and continued with their stroll. She looks good. Happy for them for sure! Love the couple. Wish them happy life together and with little one.